It’s day 14 and I was thinking about the finality of violence versus a purposeful declarative peace. 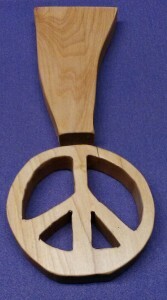 Today’s peace is made from scrap maple. I drew an exclamation point with pencil and cut out the peace sign on the scroll saw. I originally had this as one piece but It looked like a peace sign wearing a hat not an artist rendering of an exclamation point. Seperating it made it look more exclamation point-like. Though now looking at it, the top is starting to look like a distorted outline of the state of Vermont. Whatever works. It’s another peace sign. This entry was posted in 365 days of peace, on-going projects, wood working by brighid. Bookmark the permalink.